Kyle Muller with his nine gold medals. With 20 swimmers competing, the club brought home 46 medals (19 gold, 15 silver and 12 bronze) to beat more than 40 WA swimming clubs. 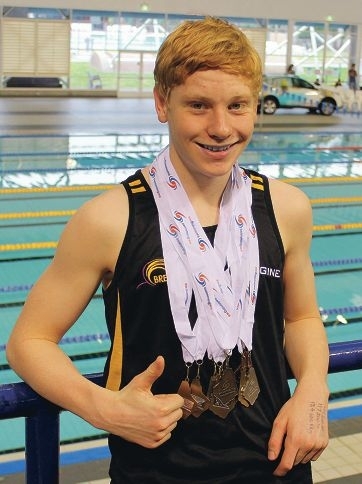 Kyle Muller (14) was named one of the club’s most outstanding competitors winning nine gold medals, as was Robyn Lee (14) who won four gold, two silver and two bronze and qualified for eight events at the national championships in August. Lee also broke a WA resident record in the girls’ 14-years 100m backstroke, finishing in 1min 02.66 sec. Grace Hull (14) was also a standout with one gold, four silver and one bronze medal, qualifying for nationals in the open women’s 400m freestyle, as well as Brody McGowan with two gold, one silver and two bronze medals, qualifying for the boys’ 15 years 50m and 100m backstroke. Other Breakers’ medal winners were Kieren Pollard, Jake Smith, Benjamin Vafeas, Chante Du Randt and James Galbraith. Joondalup-based Arena Swim Club had good results too, winning two gold, eight silver and 17 bronze medals. Yolane Kukla (17) broke a WA Resident record in the women’s 17 to 18 years 50m butterfly, winning with a time of 26.33sec, while teammate Diane Okulicz won bronze. Okulicz also won another three silver and one bronze medal. Other Arena medal winners were James Claxton, Candice Wall, Justin Martin, Ben Roberts, Tristan De Villiers, Dylan Lotti, Brittany Beesley and Ryan Butler. Local swimmers performing well included Sorrento’s Lennard Bremer and Ryan Steenkamp, part of Westside Christchurch Aquatic Swimming Club men’s 4x100m relay team that won gold. Steenkamp won another gold, silver and bronze medal, while Bremer won another gold and silver. Landsdale’s Gianna Leone also won four silver. As well as qualifying for nationals, the results will be used to select swimmers to represent WA.